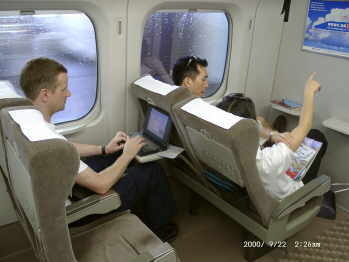 We left Hiroshima early in the morning on a Shinkansen to Osaka, Japan's third largest city. 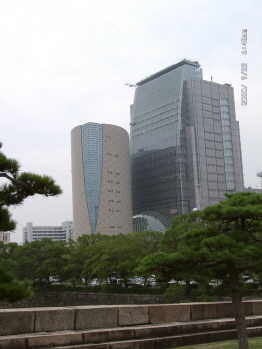 It is a city of trade and industrial center of western Japan. People of this city are very friendly and helpful.This was really necessary as the transportation in the city was rather complicated. 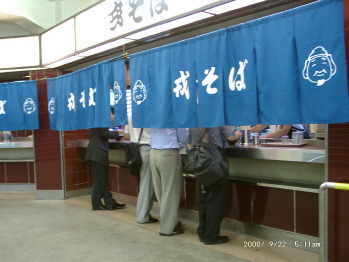 When we saw these gentlemen in a train station (No, this is not a voting booth, it is a counter of noodle restaurant), we started to feel hungry again. Here in Japan, one seems to have constant appetite, as food always smells and looks so good. ... but amongst fellow ìslurpersî at the counter we enjoyed our cold (perfect for Japanese summer) buck wheat noodle with spicy sauce and spring onion (for only 250 Yen, appr. $3). 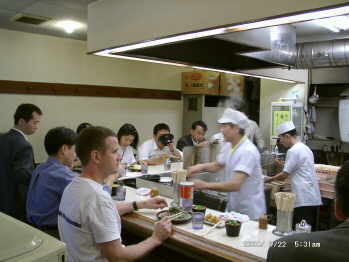 Slurping Japanese noodle is not only allowed, but it is a part of the tradition. He gave us a small piece to prove it really does not taste good (!) and gave us a cooked tofu pocket filled with rice instead. 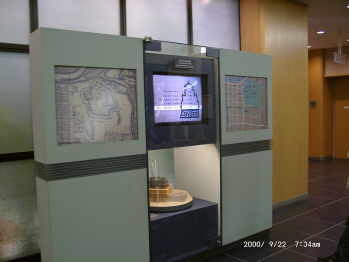 The skyline from Osaka displayed a brand new modern building of NHK (Japanís public TV station), Osaka Dome (a huge baseball stadium) and other modern objects. 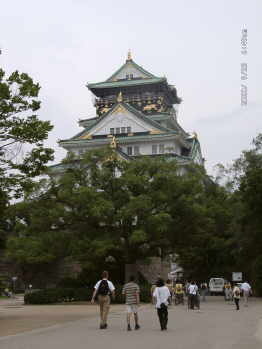 The Osaka castle, the former residence of Shogun Tokugawa Ieyasu, is a grand monument which was completed in 1586. We were very impressed by the huge stone blocks, which were brought from all over Japan to build the fortress. The largest rock is 8 yards high and 16 yards long! The inside of the supposedly historic castle was a shock to us. Marble, chrome and 3 D-Multimedia-presentations with high-tech on all 8 floors. We expected a little more authenticity from this historical building and were a bit disappointed. On the way through the park to the next JR station we saw a rather unhappy sight which also Japanese have to get used to. 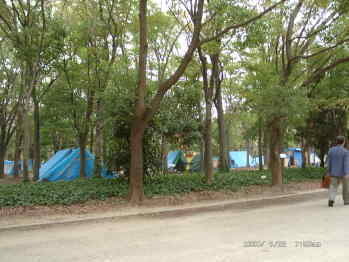 The park housed many homeless people living in hundreds of blue plastic covers and selfmade sheds. Japanese are known to be too proud to accept financial support from the government. 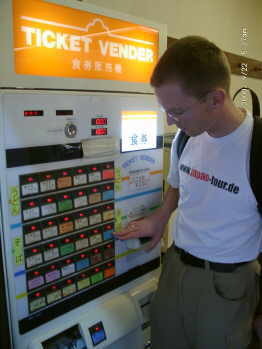 So the burst of the `bubble economy` led to many unemployed people who are not able to pay rents here in Japan. 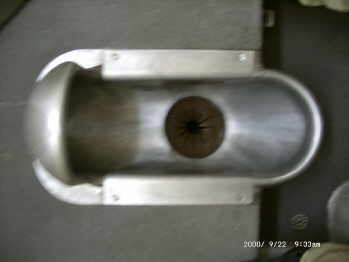 2) What is the object on the photo ?